CampingCard ACSI is a campsite guide including a discount card, which allows you to camp at up to 60% less than normal rates in the early and late low season. If you show a valid CampingCard ACSI discount card at a participating campsite, you can camp for just € 12, € 14, € 16, € 18 or € 20 per night. You'll always pay less than the lowest rate that the campsite normally charges in the low season. The CampingCard ACSI guide, the special CampingCard ACSI app and the website offer an overview of all participating campsites. The rate applicable to each campsite is also shown. Your CampingCard ACSI is valid for one calendar year. Even lower prices are possible: in certain periods many CampingCard ACSI campsites will have an extra discount. In 2019 you can camp at no fewer than 3,400 campsites in 21 European countries. All campsites are inspected by ACSI annually. 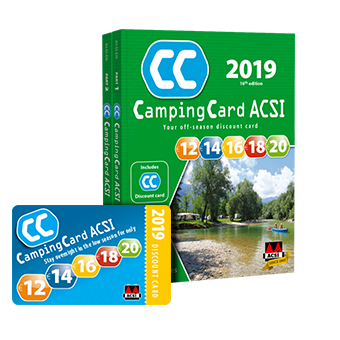 Only the +3,400 campsites in the CampingCard ACSI guide 2019 participate in the discount system. ACSI inspects 9,900 campsites annually and more than 3,400 of these will be accepting our discount card in the 2019 low season. In high season, all campsites are equally attractive. Owners guarantee the same hospitality and good service. The most important amenities are also available in the same quality in low season; you will just be paying less for them! You can also camp inexpensively with your children or grandchildren (under 6 years old). On this website, in the guide and in the app you will find 657 campsites where (up to) 3 children under 6 years are included in the CampingCard ACSI rate! The campsites can be recognised by the logo, as pictured. 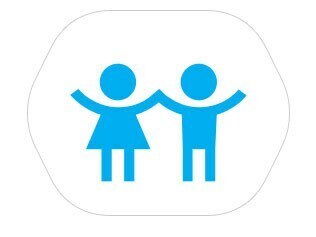 Attention: if a campsite has this symbol, they may still charge tourist tax for children under 6 years, because it is obliged to pay the tourist tax directly to the local government. Items such as shower tokens are also not included for children. 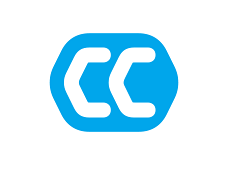 How does CampingCard ACSI work? 1. Complete the reverse of your CampingCard ACSI in full (only completed cards can be accepted). Your discount card is valid for one calendar year and is personal to you. 2. Show your discount card (valid for 2 adults) at the campsite upon arrival. It is important that you indicate that you will be camping with CampingCard ACSI when making the reservation (if necessary). 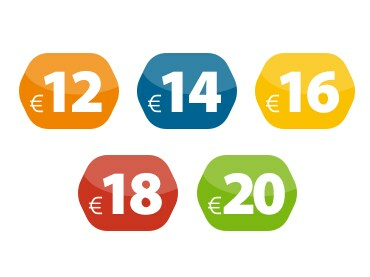 3.You will be paying the affordable CampingCard ACSI rate of only € 12, € 14, € 16, € 18 or € 20. * If you are paying upon departure, show your discount card to reception again before settling your bill. * With CampingCard ACSI you can, in principle, settle your bill at the end of your stay. But the payment method, including the moment of payment, can sometimes be determined by the campsite’s own regulations. For example, if you only want to stay one night, or if you wish to make a reservation, the campsite may ask you to pay in advance or to pay a deposit. The campsite’s reception will inform you of the campsite’s policy concerning the payment. Pitch* Tourist tax, environmental surcharge, ecotax, refuse disposal or any other requirements made by the local authority. Or motorhome with awning Hot water in the washing up sinks is not included in the rate. Electricity: connection of max. 6A. 1 dog, on the condition that dogs are permitted on the campsite. Some campsites make a distinction between standard and luxury pitches. These luxury or comfort pitches tend to be somewhat bigger and have their own water supply and drainage. You have the right to a standard pitch with CampingCard but it may also happen that you can use one of the more expensive pitches for the CampingCard rate. The campsite has the right to decide this; you can NEVER claim a luxury or comfort pitch. Take note also that some campsites have adapted their policy towards caravans with a twin axle and motorhomes that are so large they won’t fit on a standard pitch. Campsites offer pitches suitable for two adults. The campsite can decide for itself whether more than two adults may camp on them (where the CampingCard rate applies to the two adults) or whether the campers will be referred to pitches that are not allocated to CampingCard ACSI users and for which the regular rates will be charged. If the campsite used shower tokens, the CampingCard holder has the right to one shower token per adult per day. If the campsite uses another ‘shower system’, for example fifty cent coins or a SEP key, the above still applies but the camper must discuss the shower arrangements with the campsite.